Early in 2000 I had the great pleasure of corresponding with Ida Melrose Shoufler, Frank Melrose’s surviving daughter. The link and friendship with her continues and she is keen to provide detailed information about her father. Although Ida was only two years of age when Frank tragically died, both she and Frank’s wife, Frances Sacerich constantly reminisced about him. With the assistance of Ida and noted California drummer Hal Smith, together with archived documents of the late Dr. John Steiner and Pete Daily — here is the Frank Melrose chronicle. Franklyn Taft Melrose was born in Sumner, Illinois, on 26th November 1907. He was the third son born to Frank H. and Mollie Melrose. He also had a younger brother Lee and sisters Muriel, Mamie, and Belle. In 1918 his two elder brothers, Walter and Lester went into partnership with M. L. Blumenthal, better known as Marty Bloom, to form The Melrose Brothers Music Company. There is no evidence that Frank had any business connections with the company. Frank attended Bridgeport Township High School where he attained high academic marks in all subjects. Classes attended included, English 1 and 2, Latin 1 and 2, algebra, geometry, ancient history, medieval history, modern history and orchestra. Frank’s first instrument was the violin, which he took up at the age of six or seven. He received formal tutelage from a music teacher and he quickly became very proficient on this instrument. So much so, that when he was about ten years old he represented his district at a violin contest in St. Louis. At sixteen, he was class President of his school. Ida Melrose Shoufler, daughter of Frank Melrose, sends the following rare photograph of her mother, Frances Melrose. Frances and Frank Melrose were at Bud Jacobson’s home in Chicago about 1933, when Merritt Jacobson, Bud’s son, took this photograph. Marie Jacobson, Bud’s daughter, was kind enough to give it to Ida in March 2007. Frances Melrose, a slender, pretty little female, who, according to John Steiner, lived next door to Sam’s club, a dance and dine roadhouse on Greenbay Avenue in South Chicago. On busy nights Sam would hire Frances to help out. 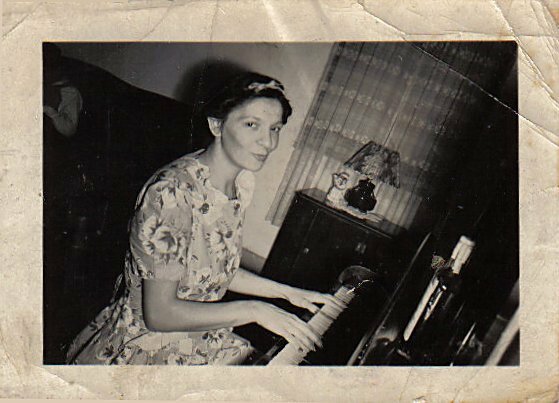 Marie Jacobson recalls that it was love at first sight between Frank and Frances. Note: See also the in-depth article Kansas City Frank by John Steiner, which recalls the meeting of Frances and Frank. Special thanks to Marie Jacobson. Brian Goggin sends the following article for a previously unknown Frank Melrose engagement in Hammond, Indiana from The Hammond Times, dated Friday, 10th March 1939, page 16, column 6. One of the most interesting meetings of the year was held Thursday afternoon by the Hammond Lincoln school PTA. The program arranged by Mrs. Kellen included a talk by Miss Doris Keane of the Hammond radio station. Her remarks on the radio as a medium of community aid and convenience were enlightening and thoroughly enjoyed by all. Prof. Lawrence Gushee sends the following article from Down Beat, dated 1st March 1940, Vol. 7, No. 5, page 20, column 3. Chicago — An outfit of seven guys is playing a sort of jazz around here that would knock Chicago style enthusiasts right out from under their tops. They go Muggsy Spanier one better in using a banjo, and they’ve dug up a library of old Jelly-Roll Morton things and Elmer Schoebel arrangements that were published by Melrose here years ago. There are no other copies of the arrangements to be found anywhere, they tell me. The tunes include Feelin’ That Way (which Tony Pastor’s band just recorded under the title Watchin’ the Clock), Shreveport Stomps, Roll Up the Carpets, Tampeekoe, Russian Rag and Jungle Blues, besides a couple dozen more. Pete Daily, fronting the bunch on trumpet, gets that rhythmic drive in his lead that so few guys seem able to find today. LeRoy Smith is playing E-flat clarinet and can be listed as one of the few fine Chicago style purists left today. Jack Daly on banjo gives the combo a wonderfully true-to-the-period trip-hammer rhythm that not even Muggsy’s band got. Frank Melrose, who has been playing fine blues for years, although nobody knows it, is on piano. A member of the Melrose publishing family, Frank provided the library for the group. Muggsy’s bassist, Bob Casey, was with this bunch until recently, when he was offered a job with a strolling combo in Aurora. (Of course this Daily band doesn’t have a job). Bob was replaced by Willie Sherman. Bill Helgart on trombone feels the tradition with his fill-ins and ground floor effects, and Harold “Sleepy” Kaplan fits right in on drums. To say that June Davis with the band sounds like Billie Holiday would be the ultimate in understatement. You don’t realize there are so many fine individual nuances to Holidays’s singing until this Davis gal reveals them in her work. It seems that her subtlety with them is every bit equal to Billie’s too, but it’s the very idea of another gal performing them that makes them stand out so. She’s really got it. As I say, this outfit isn’t working (not at press time anyway). Maybe they’ll find some spot where the kind of stuff they play will be tolerated. Maybe they won’t. In case they don’t, Frank Lyons of Chicago has a couple of private records they made. Maybe he’ll let you hear them if you ask real nice. Prof. Alan Wallace sends the following article from Down Beat, dated Thursday, 15th August 1940, Vol. 7, No. 16. 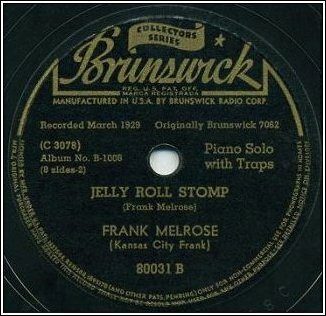 “The Kansas City Frank” who was always thought to be Jelly Roll Morton is Frank Melrose! Verification of that was made last week in the Yes Yes Club on Chicago’s State Street where Frank, piano playing member of the famous Melrose publishing family, now taps the keys. Melrose acknowledged he is the “Kansas City Frank” of early record fame. 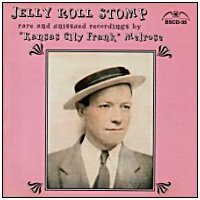 Collectors and even Delaunay have long credited Morton with Brunswick 7062 Jelly Roll Stomp and Pass the Jug (both Melrose’s own tunes) because Jelly’s name appears. Melrose was working at the old Cellar Club in Chicago when the Cellar Boys waxed Wailing Blues and Barrel House Stomp. He played piano on the two now-famous with Wingie, Tesch, Freeman and Wettling, on Vocalion 1503. Frank went to New York with a troupe to record around 1930 and made the following piano solos: Market Street Jive (9602); Piano Breakdown (9608); Whoopie Stomp (9609) and Distant Moan (9620), according to information found by George Avakian in the old Brunswick files and verified by Melrose himself. Frank remembers recording Shanghai Honeymoon with Darnell Howard, clary, and Jimmy Bertrand, drums, for Brunswick. This and the already-mentioned piano sides have not turned up and may not have been released. Frank recalls record dates with Johnny and Baby Dodds. Two tunes owned by the Melrose people are Kentucky Blues (Frank Melrose) and Barrel House Stomp (Lester Melrose) as well as many others. Frank lately has been rehearsing with the fine Pete Dailey (Daily) band, which features a banjo, in Chicago — a real “old ragtime” group. 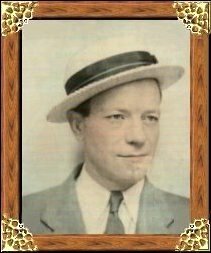 Note: Frank Melrose, the younger brother of Chicago music publishers Walter and Lester Melrose, was probably the first white pianist to come under the spell of Jelly Roll Morton. Hal Smith sends the following article, which was first published in the Piano Jazz magazine, No. 1, pages 10—12. Jazz Sociological Society of London, 1945. I had heard about the pianist Frank Melrose by 1930. Both of us lived near Hammond, but because he played up in Chicago or in Kansas City, he wasn’t home much, I didn’t meet him until later. Fellow musicians made a legend of his terrific piano style. It was in about 1932 that we worked together for the first time on a gig in Hegewisch. I started the job on bass horn, but before half the evening was over our trumpet man went blotto, so I finished the night on his instrument. Little details of that job are clear in mind. I recall as if it happened yesterday how Frank played even beyond his reputation — a solid and beautiful barrelhouse piano. He wore a brown suit; his straw hat was crown up on the upright lid. He played with his hands high over the keyboard, like a classical man; his fingers walked around like spider legs. Afterwards we were on a lot of weekend gigs together. Whenever I got a job or could suggest personnel, Frank it was on piano. Evidently he was satisfied with my horn because he used to call me for work too, perhaps even oftener than I called him. One night in the summer of 1933 Frank and I went to the Fair in Chicago, and then when it closed, to some spots on the Southside. At one place Frank heard a good sounding piano. He pushed a fumbling black kid off the stool and we took over for about six hours. Along about daylight five Indians arrived from one of the Fair’s sideshows. I guess Frank didn’t realize about Indians and firewater when he said, sure, they could use our jug. When the quart was gone, we got some more. Soon the chief went mildly nuts and insisted on marrying a dizzy frump who had come in and had started giving them the routine. Frank wanted everybody happy, so he put his coat on backwards and married the couple with a phone book. Last we saw they were blissful. By 1935 we were pretty regularly together. There were several weeks at Johnny Nichols’ in Calumet City with Owen Johnson drums and a Joe Sullivan reeds. At Nichols’ we celebrated like New Year’s Eve on the night when Frank’s first child, Franklin Jr., was born. In 1932 we had a pretty good stay at the Continental Club in Cal City. Nick Nicholas was on drums, Dooney Ward clarinet. During this time my eyesight failed completely for several months. The fellows had to pick me up at home to take me to the job, and then lead me to the stand and afterwards down again and home. Sometimes they came during the day and we’d talk or walk or listen to the radio. Frank’s playing had kids and young musicians packing around the stand every night. He killed them and us with his unpredictable breaks, wild solo choruses, and the piano burlesques he’d do with a straight face. One of his tricks reminded me of the drunken dance where the dancer begins to lean and then runs to catch up with himself, but finally too late. Frank would play a staggering arpeggio or chromatic chords, getting farther and farther off the beam, and finally as if ‘What the Hell’, he crashed both arms down on the keyboard. Two beats and away he’d go again. During my blind spell I couldn’t see the crowd that applauded Frank’s solos, but it made me feel good inside. He was my boy. I was getting an idea like religion that everything in spiritual life was in good jazz and that we were almost over the hill, almost we were playing perfect jazz. The joint jobs were more fun for us than anything that happened since, still there was something more we wanted. By 1935 we had begun to shape in our minds a dream band, an outfit that would stick together until it was perfect, playing jazz, ragtime, and blues. Jack Daley (Daly), who sometimes came in on piano when Frank couldn’t, had the same slant. But he knew Frank was the man for piano, so he concentrated on his banjo. When we talked about the dream band we considered the fellows we had worked with. Some of them seemed consistently better than anybody on records; conceitedly perhaps we didn’t bother with anybody outside the Chicago area to get exactly what we wanted. Just as any jazzman whom we had learned to know on records, our boys made mistakes, but in the dream we had cured their errors or rehearsed away their shortcomings. And honest to God, it finally worked out that way, John. Sleepy Kaplan became our drummer (he’s at a place on North Avenue now); LeRoy Smith clarinet (he was last heard from on Bataan). Bill Helgert was trombone (now in Boyd Raeburn’s outfit at the Band Box in Chicago). Bill Moore was on bass. All of us had the Blues and Dixieland spirit. It was Frank’s library which we used, and in a short time we began to find that as well as on the Blues and two-beat jazz we were sold on Frank’s versions of breakdown ragtime tunes like Russian Rag, The Romp, Wild Cat, and Roll Up The Carpets. Frank gave us the ragtime urge by showing us what could be done with it. I’ve listened to every ragtime band that has come out on records, and to dozens which haven’t. None of them could compare with ours, I honestly believe. Maybe Frank was the only man who ever lived who knew all the secrets. Some day I hope I can get with a group that will make that kind of music again. You’ll learn then what I’m talking about. It didn’t occur to me until later, that I had neglected to tell Fazola that our spirit stemmed from the results Frank drew out of us with the same kind of natural ease Jelly Roll had used in shaping his groups. When recently I heard Lu Watters band I recognized from their first note that their greatest deficiency was a Frank Melrose, someone who could dominate and mold the group into musical unity. Louis, Muggsy, Fats and Noone have done it. For two reasons this was a group like nothing commercial. First, because we couldn’t wait for rehearsals (we even got together on Sunday afternoons); second, we couldn’t get jobs. Once when we did manage to snag an Irish picnic up on the North side, a priest who apparently knew all things righteous asked for Georgia Swing. That was No. 19 in our books. But you may be able to imagine how rushed for jobs we were not, playing full programs of Georgia Swing, Gary Blues, Bluisiana, Sweet Daddy, 69th and Wentworth, Have You Ever Felt that Way, and rags. Nearly we got in the Sherman Hotel — nearly. Even though nobody hired us, there were a lot of good people who knew what we were doing and said so, and gave us confidence. 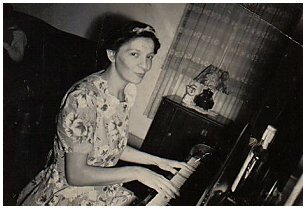 “Hummer” Collette, now with Columbia’s Chicago Studios, was then at Gamble’s recording laboratory. After hearing us, he invited us to use Gamble’s sound-treated rooms and good pianos. As we played he would often copy things down on record. Frank Lyons came over from his brokerage office on LaSalle Street to listen and to buy copies of what he liked best. When Hummer left Gamble, Frank bought all the copies we fellows in the band hadn’t wheedled away. Some I have still, kind of ragged now — Wild Cat, D. D. Strain, and a piano solo. In 1936 and ’37 Frank and I sat in many times with Lee Collins’ band at the Derby Club. Lonnie Johnson was for a time in the outfit and he gave Frank such kicks with his 12-string concert guitar that we never would quit until everybody had dropped out dead drunk or dead tired. I don’t suppose Frank admired any musician more than Lonnie except Jelly. Here are some incidental data. About the time of the Chicago Fair, Frank played with Max Miller’s outfit at Club Ultra, 39th and Cottage. Frank’s recording of Whoopee Stomp on Paramount is really Boy In The Boat, which was always one of his favorites. Wherever a piano can be heard on the Kansas City Tin Roof Stompers sides for Brunswick race series, it is Frank. He may not have played on all sides, since I cannot hear piano at all on two of them. I am positive that Frank was a pianist on the 6 Memphis Nighthawk sides for Vocalion. It was about 1937 that Frank and Georgie Barnes worked for the winter at the Little Club in Hammond. Georgie was about sixteen, and his father brought him to work and then called for him about midnight. Papa would sit around a while if they were really hitting the ball, or if a session had developed. No wonder Georgie has always worshipped Frank — you should have seen how, if business was dull, they would spend entire evenings on jazz rudiments. Frank enjoyed teaching earnest youngsters who showed promise. One of the Detroit characters figuring in his reminiscences was a hoodlum who flashed a gun when Frank made like intermission. After bullying Frank for three hours, friend hood would clear up his little joke with a $10 tip. There were some things about that Sunday before Labor Day 1941, the day before Frank’s death, you left unsaid. Late on Sunday morning, Frank came to our apartment in the Windsor-Wilson. My wife, Faye, helped him fix a bite, and then I sent him to the davenport to nap for a few hours. After rolling out, he played with our kids until dinner — that was unusual for Frank. I never before saw him show such interest in any children except his own. Frank was jubilant about the prosperity his machinist’s job was to bring. Faye caught the mood and celebrated by preparing a whoppin’ chicken dinner. That early evening, while I played a society fray at the Sheridan Plaza, Frank went to the Espana to see Max Miller, Sleepy, and Clary Vern Joachim. (I had been playing with the boys up to the previous week or so, but because business slumped, the boss had to lay off first our singer, then the brass section; within another few weeks chronic slumping killed the spot). After short stops in several spots, he came back at 11:30 p.m., in a hurry to make the one o’clock South Shore train to Hammond. I remember Frank saying that on the Saturday night previous he had been down to the Southside looking for some of the old familiar ‘barbecue gang’ around 48th and State. None were around. He mentioned that he wanted to try again when he had more time but tonight he had too little money left and time was short. I repeated this comment at the inquest after his death. As I said goodbye, I told him that I would stop off at the Melrose cottage on my way back from Crown Point, where I had a job the next night. I left him at Wilson Avenue. Some of us said at the inquest that many circumstances of his death smelled fishy. Frank had no business at 135th (130th) and Oglesby, where his body was found; it was a lonely place only indirectly on his way home. Although bruised as if a car had run over him, Frank’s face had a long, clean cut below the left ear. His watch was not damaged. Nothing remained in his billfold but his Social Security card. Nobody knows. Millie Gaddini sends the following article from the Pickup magazine, dated April 1946, Vol. I, No. 4, pages 2—3. Bill Haesler sends the following article from the Playback magazine, dated Oct.—Nov. 1949, Vol. 2, No. 10, page 14, columns 1—2. WALTER MELROSE AT THE PIANO . . . ! Sparkling-eyed old-timer Walter Melrose is a warehouse of jazz information. Of course he should be, having been a jazz publisher and talent promoter since the days of the N.O.R.K. and Oliver, with whom he composed or co-published a mass of jazz standards. Walter is the brother of Kansas City Frank and Lester, Victor’s race series supervisor. Several of the thorough Jelly collectors had held this item in ‘uncertain’ classification. I had determined several years ago that Volly de Faut was the clarinetist, but the pianist was a bit more difficult. Volly did not hear the record, but he remembered making it and felt positive that the pianist was white. Yes, Walter remembered arranging the date. The two tunes were being pushed by his Melrose Music Publishers at the time, and he had sold Gennett on lusty singer Kitty Irvin. On the record Walter played piano himself. And this is his only appearance on record. 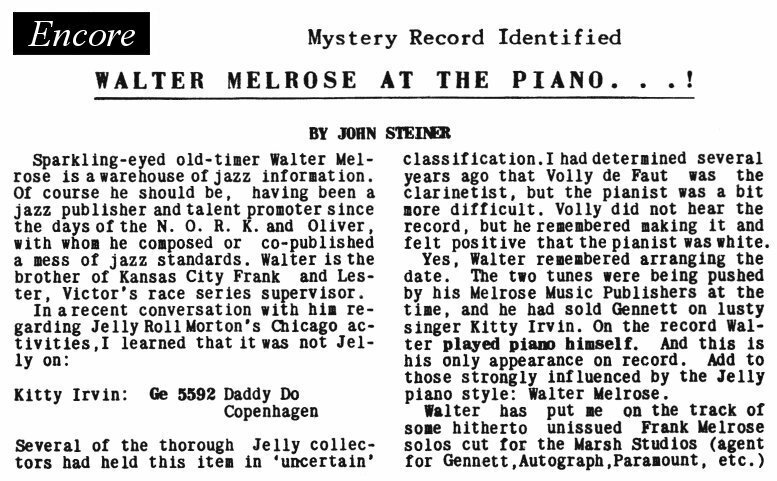 Add to those influenced by the Jelly piano style: Walter Melrose. Prof. Alan Wallace sends the following article, which was headlined on the News page of Down Beat, dated 15th September 1941, Vol. 8, No. 18. Struck Down by a hit-and-run driver or by thugs, Chicago blues pianist died at south Chicago within 15 minutes after he was found lying mangled in a south side Chicago street early Labor Day morning. He was the “Kansas City Frank” who played the piano believed for a long time to be Jelly Roll Morton’s on a number of early Brunswick jazz records. Chicago — Frank Melrose, considered by most Chicago musicians who knew or heard him to be one of the finest blues pianists of all time, was found fatally injured lying in a south side street early Labor Day morning. According to police, who were unable to determine whether he had been struck by a hit-and-run driver or had been assaulted by hoodlums, Melrose was so mutilated as to be identifiable even by his wife, who recognized his coat. Melrose, who lived in the nearby Indiana town of Hammond, had spent the evening with musicians and friends in the town. Trumpeter Pete Daily and clarinetist Bud Jacobson were among the last to see him alive. Frank left them at about 7 o’clock Labor Day morning, on his way home. Before he died police heard him mumble “Bud Jacobson,” several times. They phoned Jacobson, whose wife Katherine, informed the Melrose family of the tragedy. A coroner’s inquest to determine the cause of death was pending at press time. Typical of the plight of so many truly gifted jazz men, Melrose never seemed able to make a decent living at his art, but occasionally found work playing in taverns and joints of the Calumet region southeast of Chicago. The last job he had worked on piano was with Joe Sheets at Cedar Lake, Ind. 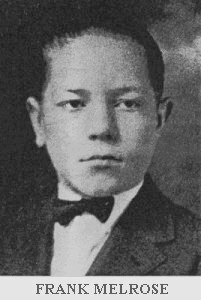 For the month prior to his death he had been employed as a machinist at the Press Steel company at Hegewisch, Ill.
Frank left a wife and three children, girls aged 5, and 2, and four-year old Franklin P., Jr. There was no insurance. Other survivors are Melrose’s mother and father, three brothers and three sisters. The deceased was nearing 34 years of age, having been born Nov. 26, 1907, in Sumner, Ill. He was buried at Mount Hope, Ill., Sept. 4. Alex van der Tuuk sends the following article from the Melody Maker, dated September 1950. 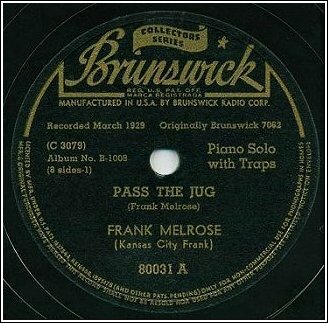 Another well-known name in jazz, both as pianist and composer, was Frank Melrose, whose body was found in a road near Chicago on Labour Day 1941. Franklyn Taft Melrose was born on November 26, 1907. Much of his early life was spent in Kansas City and, under the name of Kansas City Frank, he made a number of recordings, both piano solos and with bands, for the Paramount and Brunswick companies. Best known of these is, perhaps, “Aunt Jemima (Stomp),” “St. Louis Bound” as by The Kansas City Tin Roof Stompers (Brunswick 7066). Under his own name Frank recorded for Gennett and Varsity, and, during the last years of his life in Chicago, along with Bud Jacobson and Pete Daily, he recorded for Signature and also privately. Brian Goggin sends the following article from The Vidette-Messenger, Valparaiso, Indiana, dated Tuesday, 2nd August 1955, Vol. 29, No. 25, page 1, column 3. Funeral services for Franklin Eugene (Freeman) Melrose, 18, whose skeleton was found in the Kankakee river July 12 by three Hebron fishermen will be held Wednesday at the Todd Funeral home in DeMotte. Deputy Coroner Herman Kosanke officially released the remains at 11 a. m. today after receiving a final identification in affidavit form from the Indiana State police. It was signed by Detective Sgt. Arthur Keller. However, Kosanke stated that a formal inquest will not be held until he receives written information from Sgt. Charles Davis of the Indiana state police pathology department, who made the positive identification. Sgt. Davis is on vacation at the present time. Franklin Eugene (Freeman) Melrose was born in Hammond Oct. 14, 1936, and disappeared Nov. 2, 1954, while on a duck hunting expedition. He was the son of Frances and Franklin Melrose. His father was killed in an automobile accident in 1941. He lived in the Wheatfield area for seven years moving there from Rensselaer. He was graduated from the Wheatfield High school and at the time of his death was employed by the Indiana Steel Products company as a technician. Surviving besides his mother is his step-father, C. W. Freeman, Gibson City, Ill., five half-sisters, Mrs. Francene Watson, Wheatfield, and Ida Mae (May), Elizabeth Ann, Maxine Evonne, and Carolyn, all of Gibson City, and two half-brothers, Wayne and Dale, also of Gibson City. The Rev. Eugene Dayka will officiate at the funeral services. Burial will take place in the Wheatfield cemetery. Friends may call at the Todd Funeral home this evening. Brian Goggin — Letters and information to Mike Meddings, 19th and 21st October 2009. Ida Melrose Shoufler — Letter and information to Mike Meddings, 27th August 2009.